Bunnies, more commonly referred to as rabbits, are small mammals which are abundant in the wild, but also commonly kept as pets. They're part of the family Lagomorpha, which also includes hares and pikas. Many people consider them easy pets to look after but may not realize they have a range of complex needs. They're social creatures who must be kept in groups of two or more. More than 80 different species exist in the family Lagomorpha. They're native to every continent, apart from Australia and Antarctica, although they're not naturally found in parts of southern South America and on many islands. However, certain lagomorph species, such as the European rabbit, were deliberately introduced to other countries for several reasons, but mainly as a source of meat. They're now in almost any country on the globe. Different species within the Lagomorph family live in different natural habitats. Common rabbit species, such as the cottontail and the European rabbit, like to live in areas where there is loose, free-draining soil and plenty of shelter, such as rocks and shrubs. They often live in pastures or crop fields with hedgerows, or in sand dunes. They live in burrows either dug themselves or by other creatures. Hares don't live in burrows, but in hollows in the ground. Different species can be found all across the world, from Europe to the Arctic. Pikas live in alpine terrain, on maintains and rock faces. Many more people are choosing to keep an indoor habitat for their pet rabbits. The best option is to bunny-proof one or two rooms and allow them to roam freely. You can even toilet train rabbits quite easily, so that they'll go in a litter tray. If letting them roam freely isn't practical for your home setup, you could invest in a large puppy pen to give them space to run around in. You can also buy large rabbit cages, but they aren't suitable as a full-time home for your bunnies, just as a bedroom or a secure place to stay while you're out. 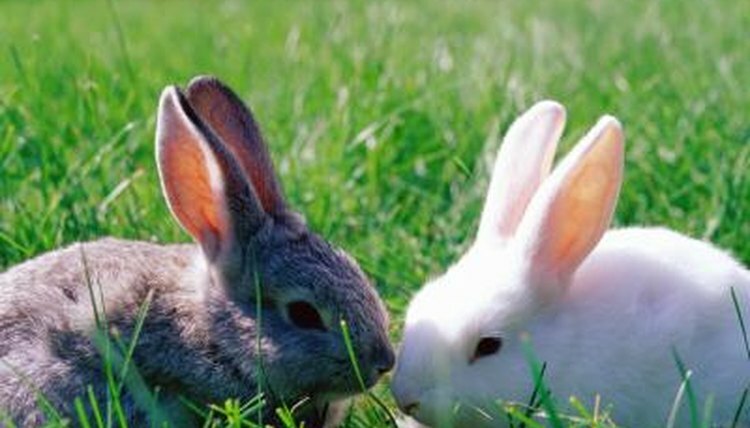 Small outdoor rabbit hutches are no longer seen as appropriate habitats in which to keep pet rabbits. If you must keep them in outdoor hutches, ensure they have enough room to stand up on their back legs so that their ears don't touch the roof, can lie completely stretched out in any direction, are able to hop several hops in a row and can turn around without trouble. All rabbits will also need an outdoor run or enclosure so they can spend time in the open air, when the weather's suitable. American Rabbit Breeders Association, Inc.